When Call of Duty: Modern Warfare 2 hit last year it arrived in stores escorted by a virtual phallanx of tie-ins of varying quality. There were the controllers, the controller faceplates, the throat mic. Some were good, some were bad. We all rolled our eyes at the marketing and moved alone. This year Call of Duty: Black Ops lands with the sort of zealous marketing that makes last year's peripheral collection a joke. Ignoring for a second the Call of Duty: Black Ops Jeep you can buy, there are still plenty of ways to brand yourself a true fan of the series. 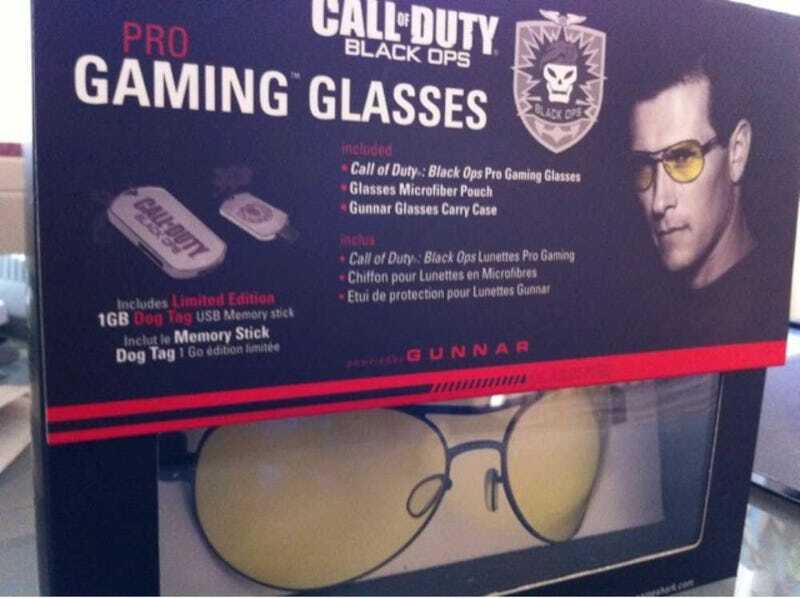 There are controllers, mice, headphones and now even an $80 pair of Call of Duty: Black Ops-themed gaming glasses. The glasses, the result of a tag-team effort by Mad Catz and Gunnar glasses, have a 70s aviator look and come with a fancy magnetically-sealed Black Ops case, a microfiber pouch and a USB Black Ops dog tag. I'll be wearing the glasses while I play the game next week, testing to see if it helps make me 70s cool and eases eye pain.